Think of your favorite strategy RPG. 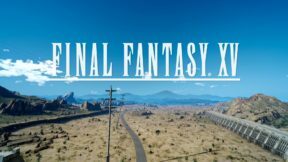 How does it differ from other strategy RPGs? Does it do anything different than the others? Does it reinvent the genre? 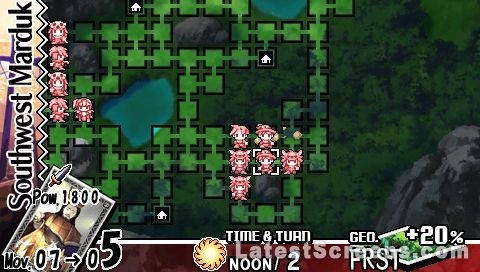 What if you took gameplay elements from strategy RPGs such as Fire Emblem, Advance Wars, or the Disgaea series? Yggdra Union: We’ll Never Fight Alone does just that and adds something new to the mix. 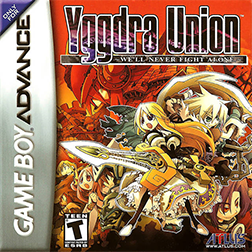 At a glance, Yggdra Union looks like a fusion of Fire Emblem and Advance Wars. 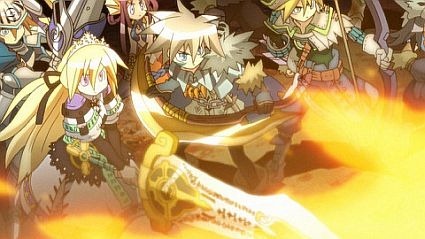 Delve deeper into the mechanics, and one will notice that they can perform a sort of “team attack” by strategically placing their characters on the battlefield, ala Disgaea. 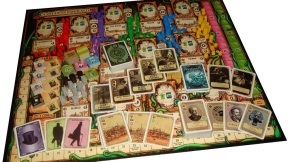 What sets Yggdra Union apart from the aforementioned games is its unique combination of a card and union system, along with limited real time combat. Yggdra Union originally released in the United States in November 2006 for the Nintendo GameBoy Advance game system. Developed by Sting Entertainment with publishing and localization done by Atlus, the game does not have a huge following and remains a niche title, even with a PlayStation Portable port. With the GameBoy Advance version, Sting feared that they wouldn’t be able to fit the entire game on the cartridge. However, the PlayStation Portable version takes advantage of the better hardware and software mediums, and Sting was able to include higher resolution graphics, voice action, rearranged music, and even add more characters, story, and extra game play content. 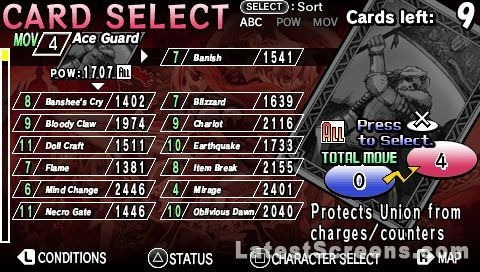 As mentioned previously, Yggdra Union looks like a fusion of Fire Emblem and Advance Wars at a glance, but as soon as you start the game, the card system comes into play almost immediately. 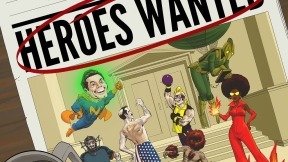 Along with selecting characters, which each have their own strengths and weaknesses, the player must also select a limited number of cards to use before starting each campaign. Cards govern the total number of spaces a player can move their characters in a turn, but also influence how much damage will be dealt to an opponent. Additionally, each card has a special skill that could potentially turn the tide of battle in your favor. The most unique game play mechanic of Yggdra Union is that of Unions. There are two types of Unions: “X type” Unions and “Plus type” Unions. 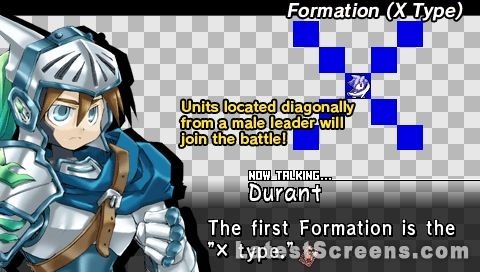 An “X type” Union starts with a male union leader, and any units that are adjacent to the leader diagonally are included into the Union. A “Plus type” Union is formed with a female leader and units adjacent to the leader in a plus formation are included into the Union. Up to five units are allowed to participate within a Union. 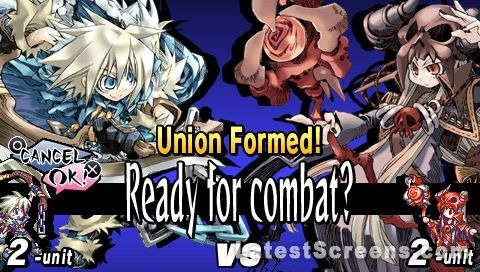 Once a Union is formed, players are asked to confirm the Union, and if so, proceed with combat. The fun’s just beginning: Combat is set in real time. As soon as a clash begins, whichever side initiated the attack charges the opponent, with the opposing side counterattacking if applicable (Certain units cannot counter). Immediately after the charge and counterattack, you can issue your units to attack in an Aggressive or Passive manner. Attacking aggressively increases attack power and possibly adds elemental attributes while draining the Skill Gauge. Attacking passively does the opposite, ergo, decreased attack and no attributes but fills the Skill Gauge. 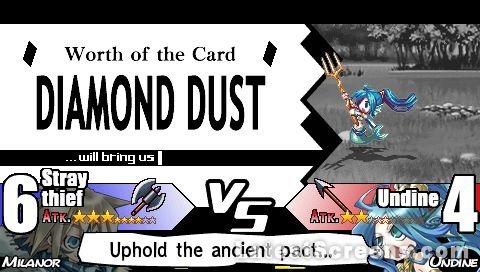 Once the Skill Gauge is full, if the Union leader is of the card’s “Ace Type” (Effectively becoming the Union Ace), the card’s skill can be used. This means that almost every unit within the Union can use the card’s skill. After the battle is over, the player is shown a results screen. 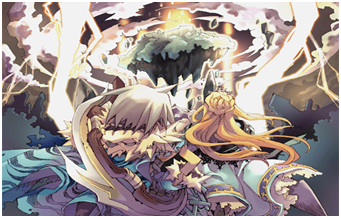 The displayed results show: if the player won or lost; the losing unit’s Morale (Health) and how much they lost; the previous power of a card, by how much it increased, and its new power; how many survivors there were after the battle. Characters in a Union also earn some experience points. Under normal circumstances, battles start with each unit having up to 8 survivors each, except in the case of mounted units which have 4. When a unit has 0 survivors, they lose the battle. When the unit has no Morale, they’re eliminated from the map. 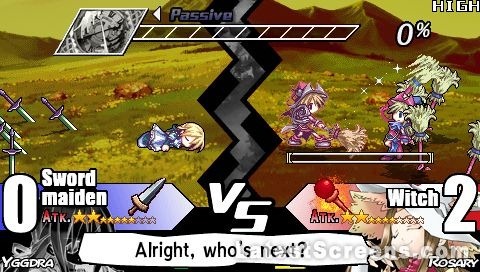 Most of the player’s characters can fall in battle (That is, lose all their Morale) and only be temporarily inactive. 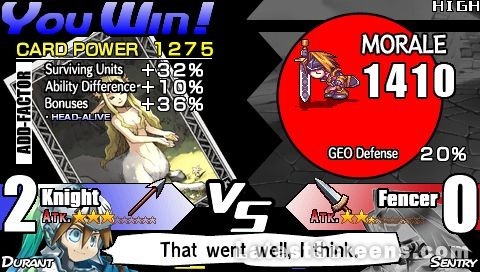 The deaths of characters Yggdra or Milanor usually result in a game over. 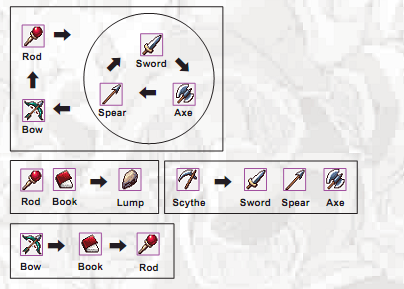 One last important gameplay feature that is common in various other video games is that of unit types and weapon advantages. The twelve unit types are: Fencer, Hunter, Valkyrie, Assassin, Knight, Necromancer, Undine, Witch, Bandit, Golem, Griffon Rider, and Skeleton. 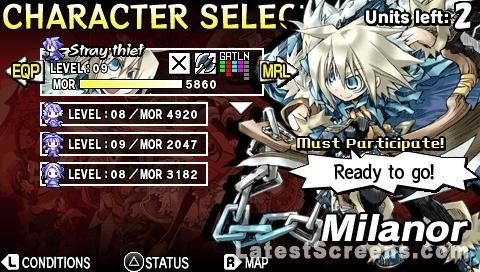 Each unit type has a different formation, weapon type, movement type, and elemental type, as well as some unique special abilities. So as not to go too in-depth about the mechanics, the image to the right shows all of the weapon types and their advantages over other types. Swords best axes, axes best spears, spears best swords, etc. Milanor, and the Royal Army are ready to take back the kingdom. With all of the cool, unique gameplay features Yggdra Union manages to seamlessly merge together, there is actually a story behind it all. It is the story of Princess Yggdra Yuril Artwaltz, a princess on the run from the Bronquia Empire which has besieged her country, Fantasinia. With her parents murdered and nowhere to go, she hides in a thieves den from enemy forces. The Bronquian military burns the den down, but are forced to retreat when attacked by Milanor, the king of thieves. Milanor and Yggdra join forces and form the Royal Army, with the intention of taking back the Kingdom of Fantasinia from the Bronquian Empire. 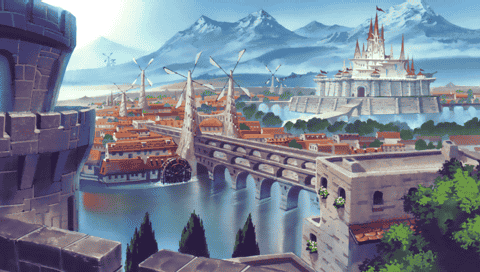 The story sequences are complimented in several ways via artwork; a portrait of a character used for dialogue, event banners used for when an important event occurs, scenery art at the beginning of a chapter, and CG artwork during key story events. Original compositions assist the artwork to give atmosphere to the story. However, story isn’t the only aspect where the music shines; it’s also ingrained into the gameplay. Each character a player can recruit (And even some antagonistic characters) have their own battle themes, and the theme either slows down or speeds up depending on if the player is attacking passively or aggressively. Spanning over nine chapters with 50 scenarios and approximately 30 hours of gameplay, Yggdra Union: We’ll Never Fight Alone is sure to be an engaging and challenging experience for fans of the strategy RPG genre. And remember: We’ll never fight alone.